I have had a knack for timing this week and I have been lucky to catch a few treasuries on etsy. Since, the spirit of Christmas is still tugging at my soul, I made two Christmas themed treasuries. The first is called "The Holly and the Ivy", inspired by one of my very favorite Christmas carols. I discovered some truly stunning pieces on etsy when I was building this collection. Obviously, there are some who approved of my selections. 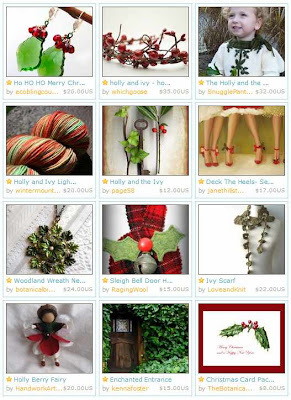 This collection, I am very pleased to say made it to Etsy's front page. I also heard from some of the sellers that I featured and they happily reported that they had some sales directly related to that exposure. Yah! I love when that happens. This one was very fun to make. 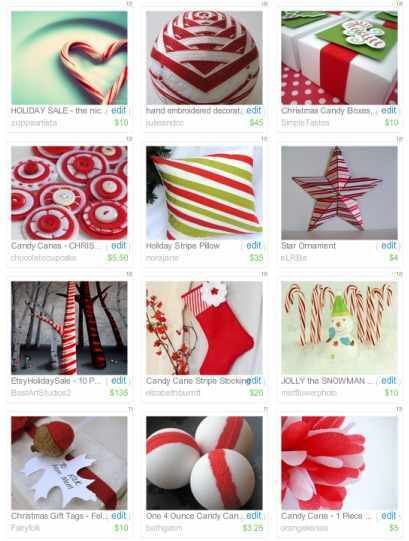 I love festive red and white, and stripey things always make me a little happy. This collection is called "Candy Cane Twist". My luck ran out a little tonight, as the treasury window opened and closed while I was off eating dinner. I thought I had time to spare. Ah well, no reason I can't go browse and see what I can create for next time.